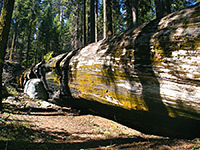 The peaceful atmosphere of the Giant Forest in Sequoia National Park is best experienced on the longer trails, well away from the popular areas like Round Meadow, General Sherman, Moro Rock and Crescent Meadow. 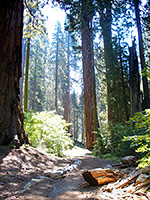 An extensive network of intersecting paths allows for many possible loop hikes, of up to ten miles, and one of the best is the 4 mile route to Huckleberry Meadow and Circle Meadow, which also passes several impressive sequoia groves, a historic log cabin and a set of Indian mortar holes, all the while crossing scenic, hilly terrain right in the middle of the forest, far from the main roads. The first part of the hike is along the Hazlewood Nature Trail, a short interpretive path that gives a good introduction to the ecology of the sequoia trees, and is easily accessed from a pull-out at the east side of the Generals Highway. This path is not signposted, so parking is usually available right at the start; if full then the walk has to begin half a mile away, from the main parking lot opposite Giant Forest Museum. An alternative start point is along the Crescent Meadow Road - see topographic map below. The one mile Hazlewood Nature Trail climbs up a sheltered, shady valley beneath many huge sequoia trees then crosses a small stream (Little Deer Creek) and returns down the far side. Notices along the path describe the history of the trees and the effects of fire on the forest ecosystem. 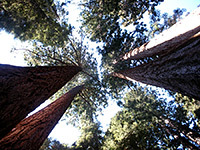 The sequoia have a mixture of sizes and conditions - healthy, damaged, fallen, burnt, hollow, etc - and some are very large, part of a lush environment that also includes ferns, azaleas, dogwoods and many other plants, creating a cool, green corridor through the rather drier slopes higher up. The Hazlewood loop is completed by recrossing the stream, while four other trails branch off at various places. The Huckleberry Meadow route is the third, at the eastern edge of the loop; this very soon passes two more junctions (paths to Bear Hill and Moro Rock), and after recrossing the stream higher up the hill, arrives at another, at which point the Alta Trail continues northwards and the Huckleberry Trail begins on the right (east). All these intersections are clearly signposted and occur over only a third of a mile, but now the main part of the hike begins, as the little-used path starts to climb steadily, leaving the shady sequoia area for a hillside of Jeffrey pine, white fir and manzanita bushes, bending north for a short steeper ascent to the top of a hill and entering an open, grassy area with just a few trees, mostly fire-damaged. 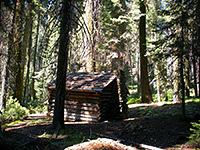 After curving round a low summit, the trail drops down to a more wooded region where the sequoia return, and reaches Squatters Cabin, a sturdy log-built dwelling shaded by huge trees. This was constructed in the 1880s by a hopeful settler, before he realized that the land in this part of the forest had already been claimed by Hale Tharp, whose cabin also survives, at the north end of nearby Log Meadow. 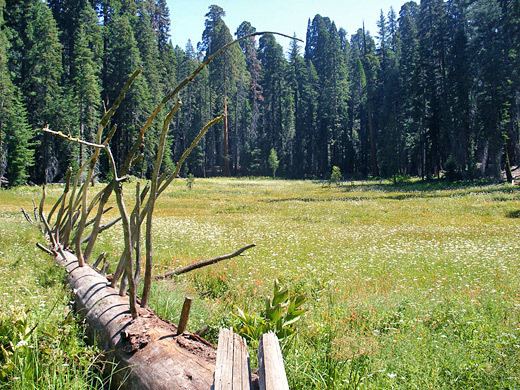 Squatters Cabin sits at the edge of Huckleberry Meadow, a small grassy clearing lined by tall, fallen sequoias radiating towards the center. 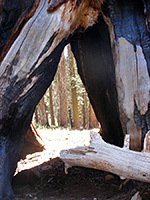 The trail splits here, with the right fork meeting the Crescent Meadow Road after 0.4 miles, en route passing the Dead Giant - a large, burnt sequoia trunk missing its upper half. The left fork winds eastwards though a big cluster of especially large sequoia growing close together, then curves round the north edge of the meadow to yet another intersection. Straight on is the way to Crescent Meadow and the Tunnel Tree, but the Huckleberry loop continues on the left (north), winding up a slope bearing occasional sequoia and levelling off after a while before the next junction, in an open area with plenty of ferns and bushes but not so many trees. Turning right here leads to Circle Meadow, the Congress Trail and General Sherman, while the left fork (Huckleberry) also soon reaches Circle Meadow, which as the name suggests is a thin, curving strip of marshy grassland, 1/3 mile long and quite pretty, sprinkled with fallen logs, large rounded granite boulders, and patches of wildflowers along the edges. One other feature nearby is Bears Bathtub, reached by a side trail on the right; this is a cavity between the two halves of a twinned sequoia trunk holding water for some time after rainfall, and occasionally frequented by bears. Another side path soon after leads to the Washington Tree, once the second largest in the world but now much reduced in size following a lightning-induced fire in 2003. The main path next crosses a small drainage and meets the Alta Trail - the 12th and last junction on the route; turning left the route recrosses the stream and enters a small treeless area where the granite bedrock is exposed, and marked by many mortar holes in the smooth surfaces, evidence of an ancient Indian village that once occupied this remote site. The trail turns to the south as the ground drops away to one side, sloping down towards the sheltered ravine at the start of the hike, then arrives once more at the junction marking the start of the Huckleberry Trail, from where the start of the Hazlewood Nature Trail is just a little way further. Maps of this area show a short cut path that connects with the Rimrock Trail near the Generals Highway, but this seems to be disused and hard to locate.